After you enjoy the exhibits and the American Adventure presentation at EPCOT’s World Showcase, make your way along the promenade from the American Adventure toward the Italy pavilion, and before you leave America, you’ll see the Fife and Drum Tavern, which is more of a pick-up window venue than an actual tavern. Here you’ll find some of the biggest turkey legs you’ve ever seen! They cost around $13 each, but there’s so much meat on them, you won’t be hungry for a while! 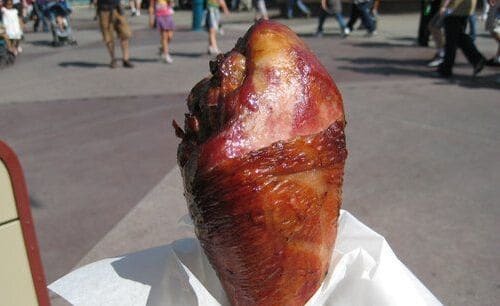 Don’t mistake this jumbo turkey leg for a mere snack on your way to dinner—if you do, you definitely won’t be hungry for dinner!